Working as the Sea Grant Legislative Fellow staffing Oregon’s Coastal Caucus, I was given the opportunity help craft House Bill 2209, the Oregon Shellfish Initiative. The intent of the Shellfish Initiative is to support Oregon’s oyster industry and preserve wild stocks of oysters for recreational harvest. The oyster industry in Oregon has already felt the impacts of ocean acidification and hypoxia, and a major component of the Initiative includes funding for continued research and monitoring capabilities. I had the opportunity to visit Hatfield Marine Science Center in Newport and see Dr. Chris Langdon’s lab which is home to the Molluscan Broodstock Program. Dr. Langdon and his grad students have been breeding and selecting oyster lines for productivity in changing ocean chemistries. The Shellfish Initiative contains an appropriation for the MBP, as the legislature sees that this research is vital to understanding how different molluscan shellfish will respond to fluctuations in the carbon cycle, and helping the shellfish industry mitigate those impacts through broodstock that is best adapted to the conditions. I was also able to tour the Whiskey Creek Shellfish Hatchery in Netarts Bay, which works closely with Dr. Langdon’s lab. Whiskey Creek had experienced substantial larval die-offs, and it was only due to monitoring equipment that detected more than just simple pH measurements that they were able to determine the cause of the die-offs. Whiskey Creek is now able to monitor and adjust the chemistry of the seawater tanks in which they raise broodstock, which they supply to approximately 75% of oyster growers on the West Coast. The Shellfish Initiative also appropriates funds to Oregon State University for ongoing support of the research partnership with Whiskey Creek Hatchery. These partnerships were in place before the creation of the Oregon Shellfish Initiative, but it’s been extremely gratifying to me to be working on legislation to fund this important research. The Initiative also increases funding to the Oregon Department of Agriculture for more frequent water quality monitoring in Tillamook Bay, with the aim of being able to reopen the bay for oyster harvest more quickly after a closure. If the Tillamook Bay pilot project is successful, the increased monitoring could be expanded to other estuaries in the future. The Shellfish Initiative also convenes a Shellfish Task Force which will report back to the legislature by the 2016 short session with recommendations on how to continue to enhance and expand the commercial oyster industry while addressing the impacts of ocean acidification and hypoxia on both cultivated and wild shellfish. Ideally, Sea Grant will continue to play a role as a bridge between research, industry, agencies, and coastal communities as the Shellfish Initiative recommendations are implemented. The bill had a successful public hearing and work session in the House Committee on Ag & Natural Resources, and will soon be heard in the Ways & Means Natural Resource Subcommittee. There is a national shellfish initiative, Washington has a shellfish initiative, and California has one in the works, so the timing seems perfect for the Oregon Shellfish Initiative, and all the parties are committed to moving it forward. It took me a few tries, but I’m finally able to log in and post, so here is my first blog entry as a Sea Grant Scholar! With the legislative session underway, things are moving at an incredibly fast pace. I’m working out of Rep Caddy McKeown’s office as she’s chairing the Coastal Caucus this session. Before session started, the Rep hosted her two legislative staffers and I at her home in Coos Bay. 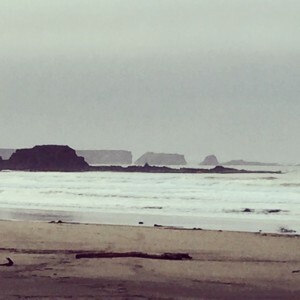 We met with Port and city officials in the district, got a great tour of the area, admired the beautiful southern Oregon coast scenery, and ate the best smoked fish I’ve ever had. Back in Salem, we hit the ground running. One of my primary focuses is helping craft an Oregon Shellfish Initiative aimed at enhancing opportunities for shellfish aquaculture, protecting wild shellfish habitat and commercial and recreational shellfish fisheries, and promoting research on ocean acidification. California and Washington have passed Shellfish Initiatives, so we’re able to look to those as templates, but Oregon has unique challenges, largely due to having much less available land for shellfish aquaculture. This initiative is bringing together industry, agencies, fisheries, and researchers to identify the best practices and priorities and is serving as a crash course in policy making for this biologist. And as a great admirer of the humble mollusk, I’m honored to be its champion. More updates to come.